The idiom in the English language “out of thin air” is typically used to describe magic and slight-of-hand. While pulling a rabbit from thin air is logically impossible, making something from the complex mixture we call “air” is very possible. Around the world scientists and engineers are working to develop technologies that can capture dilute molecules in the atmosphere and put them to work for society. The world’s first commercial carbon dioxide (CO2) capture facility in Hinwil, Switzerland, is actively capturing CO2 directly from the air! Climeworks AG, a Swiss company, built and operates this first-of-its-kind facility near Zurich. We have discussed Climeworks previously, both with their role in the Audi/sunfire “Blue Crude” collaboration and when we highlighted companies developing CO2 capture facilities. This new facility consists of 18 Climeworks collectors and is expected to collect 900 tonnes of CO2 per year. 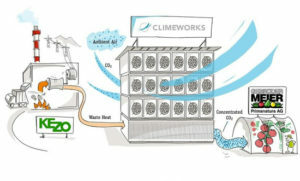 Climeworks’ technology, implemented at Hinwil, renders the capture process relatively energy neutral, as Climeworks has been able to leverage the waste heat from a waste-reclamation facility, KEZO, to aid the capture and concentration processes. CO2 collected and concentrated at the Hinwil facility is piped directly to a neighboring greenhouse that produces tomatoes and cucumbers for Gebrüder Meier Primanatura AG. By blanketing the crops with CO2 rich “air,” the greenhouse is able to enhance the productivity of their crops by nearly 20%. Previously, the greenhouse had CO2 delivered by truck – relying on CO2 from petroleum refining and fossil fuel powered delivery vehicles. The commitment of Gebrüder Meier Primanatura to purchase the CO2 from Climeworks is the aspect that makes this such a noteworthy development. The announcement of Climeworks’ facility has been met with some push back. Some believe that direct air capture of CO2 will allow CO2 emitting industries to keep “kicking the can down the road” while other experts consider it a “sideshow” and a distraction from the bigger issue at hand. Here at SOFI, we see great significance and opportunities with commercially-viable direct air capture (DAC) facilities like Climeworks’. We recognize that market innovation in solar fuels will likely arise evolutionarily, as oppose to revolutionarily, as with most innovations. However, critics and academic research tend to favor the pursuit of revolutionary, paradigm-shifting solutions, perhaps as a result of many funding agencies’ emphasis on high-risk high-reward activities. DAC of CO2 is an important part of moving towards a carbon-neutral/carbon-negative society, and there is good reason to think that market forces and consumer demand will drive the commercialization of DAC technologies. The smart phone didn’t just appear in our hands – it took decades of invention and innovation to move computing power from the imagination to the first computers, and into our pockets.